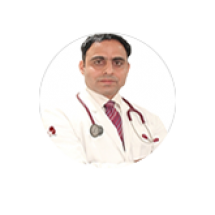 Dr. Choudhary has immense experience as an Oncologist in treating all types of Cancer patients in leading centers in Noida and Delhi. As a Professor of Medical Oncology, his area of medical interest lies in the lung cancer, breast cancer, GI and Gynae Cancer, lymphomas and multiple myeloma, Infusional Chemotherapy, Targeted Therapy, and Biological Therapy. He has over 13 years of experience of satisfied patients in his field. Dr. RK Choudhary is the Cofounder and Vice President of young oncologists group of India, it is an organization which promotes the evidence-based treatment protocols for the treatment of cancer and education awareness programs for the general public for cancer and its preventive measures. He is a member of National Academy Of Medical Sciences, European Society Of Medical Oncology and American Society Of Clinical Oncology.